Did you know that it is National Grilled Cheese Month?? Isn’t it amazing that something so wonderful exists in this world. Because it is and I am such a big fan, I have to throw out a new grilled cheese recipe for you. Grilled cheese is pretty much my heaven on earth. I mean we are talking about butter crisped bread, and melted ooey-gooey cheese. Any other delights you add are just more icing on the cake so to speak. Because it is me, I did the obvious. #3. So while I am gorging on the salad, I let myself think about what else I could fill with these wonderful sweet and salty flavors. Since there were some complaints in my house about the lack of cheese on that previously mentioned salad, I knew it had to have that creamy element added. Duh!? Grilled cheese! And the only cheese that seemed indulgent and rich enough to handle all those fresh strawberries was brie. Luscious, rich insanely delicious brie cheese. The result is beyond- please try it! 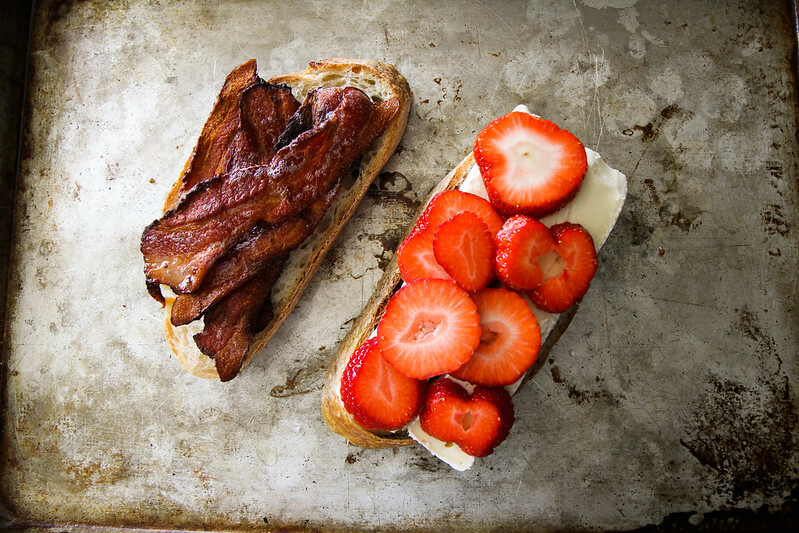 Layer the cheese, strawberries and bacon onto the bread. 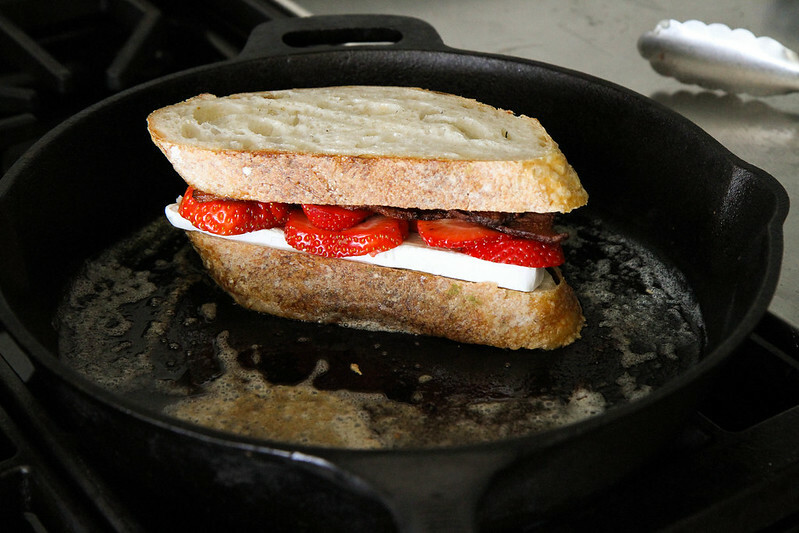 Put the bread together and place the sandwich in the melted butter in the hot skillet. 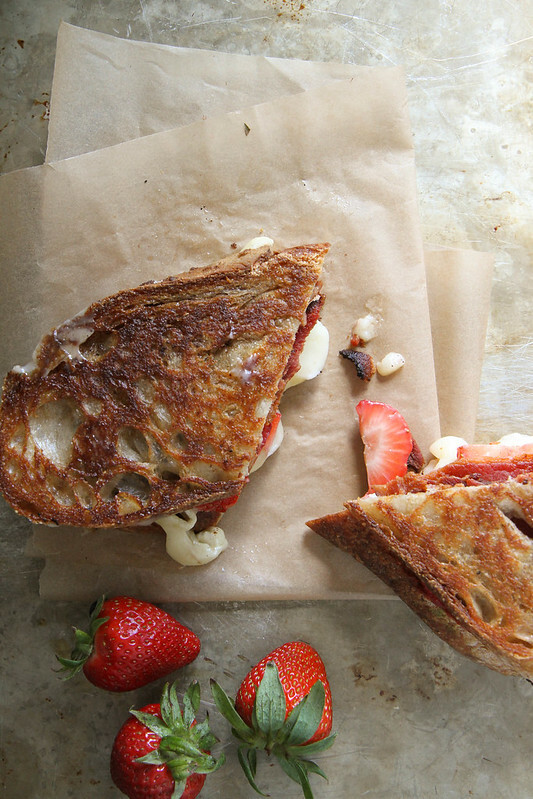 Cook the sandwich over medium heat until both sides are golden brown and the brie is melted and gooey. Slice in half and serve hot. 2 thick slices of brie. 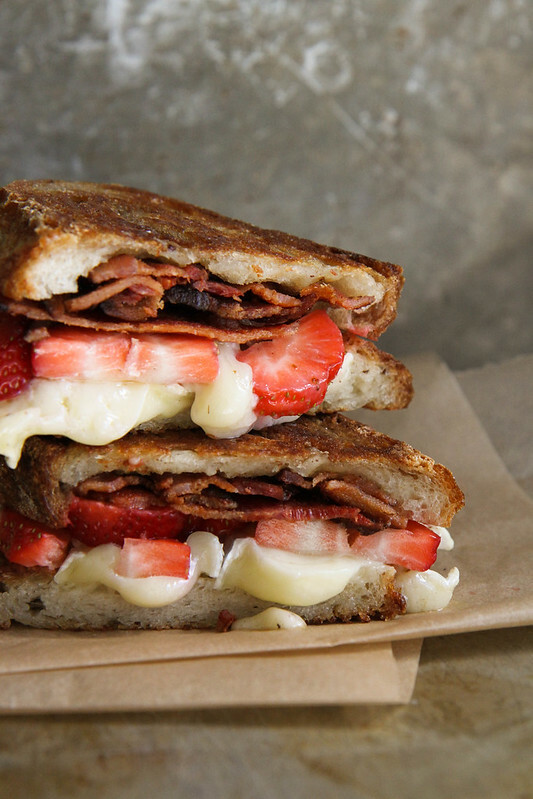 Cook the sandwich over medium heat until both sides are golden brown and the brie is melted and gooey. Oh, my. You nailed another one, Heather. Um, would it be wrong of me to add just the tiniest bit of basalmic to the strawberries? I didn’t think so. Thank you so much Maralyn, and no, that is not wrong, it is completely right!! Oh, my. You nailed another one, Heather. Um, would it be wrong of me if i added just the tiniest bit of basalmic to the strawberries? I didn’t think so. OMG Vicki. that looks so good!! This is freakin’ genius! And I agree with Marilyn that a bit of balsamic in the strawberries would be heavenly. Ok. I will totally go off my diet for this. This salty and sweet combination is amazing!! I love that it’s grilled cheese month – the best! 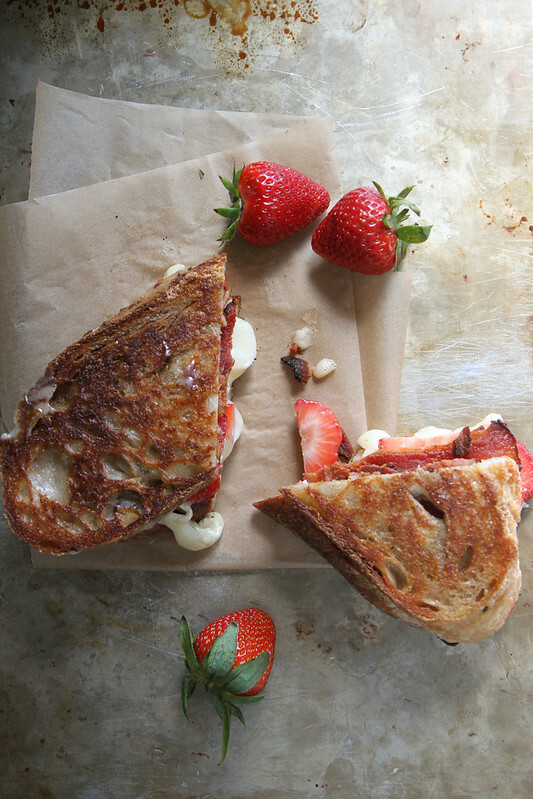 Thanks Maria- It is like the savory sister to your decadent dessert grilled cheese with brie! I did not know it was National Grilled Cheese month ~ this is the perfect way to celebrate it!! THIS is why I have an entire Pinterest board dedicated to sandwiches. Gorgeous! Fantastic sandwich, I love brie so much in sandwiches. Holy GOOEY grilled cheese, Heather! This is a lunch time must! 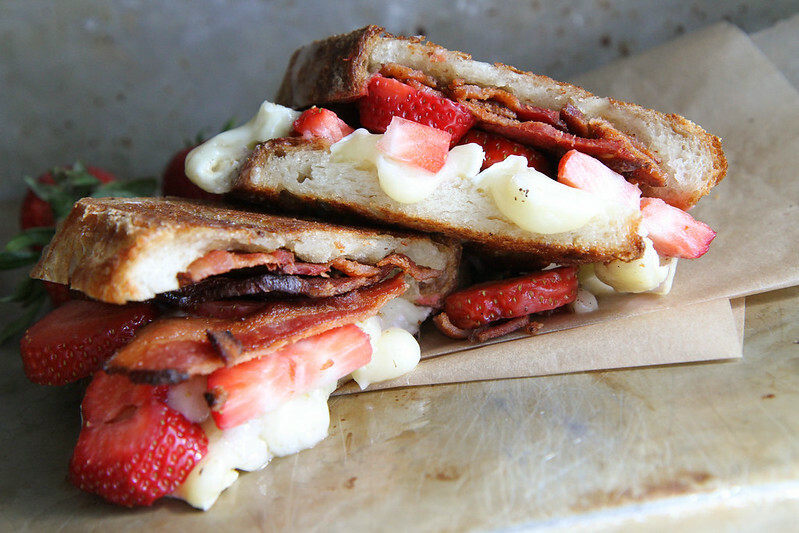 Oh my goodness, the saltiness of the bacon, the sweet berries and that glorious cheese! Love it. Oh, Heather, I love this sandwich! Bacon makes everything better! A must try! 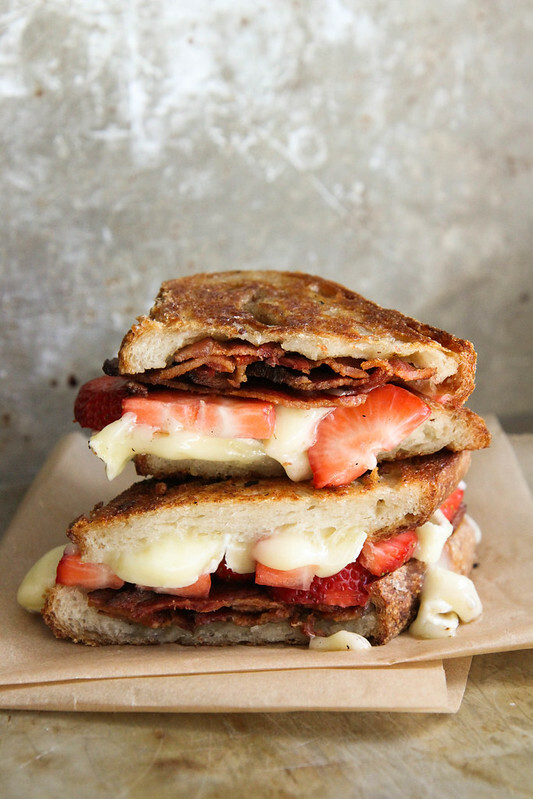 I tried this recipe with mozz cheese and strawberries instead of brie and bacon -still fantastic!! Thanks for sharing. Allison- sounds awesome! I love how stringy and gooey mozzarella gets- yum!! yes. as anything dripping with brie is, it is pretty freaking good! ALL of my dreams just came true. All of them.